Stoke City chairman Peter Coates has admitted that his club would find it hard to reject an approach from Arsenal or another top club for highly rated goalkeeper Asmir Begovic. The Bosnia international has grown in stature significantly at the Britannia Stadium over the last 12 months, with the eastern European stopper pulling out some impressive performances for the Potters. As a result the 26-year-old has been linked with Manchester United, Liverpool and Chelsea in recent transfer windows. However, Arsenal seem like the most fitting of destinations for the former Portsmouth man, who is rumoured to be a target for Arsene Wenger’s men. Despite Stoke holding onto Begovic over the summer, Coates has admitted that the Potters may well struggle to keep him if one of the big boys comes along. “You always have to be realistic about these things,” he admitted. “If a call came from a top European club and was attractive to him, then you have to look at it. “It wouldn’t be much of a surprise to me and that’s why we have contingency plans in place with other goalkeepers at the club. “We would be reluctant to sell him because you want to keep your best players, but equally you are realistic about things. You also have to consider the player’s view. With Arsenal’s goalkeeping situation certainly not set in concrete, the revelations may well come as interest to the north London outfit. The Gunners have Wojciech Szczesny as their number one, but there have been question marks over the Polish stopper and whether he is consistent enough to allow Arsenal to compete for major honours. Despite the presence of Lukasz Fabianski and the addition of loan signing Emiliano Viviano over the summer transfer window, if the north London side were to add another top-quality stopper to their contingent it would not come as a surprise. 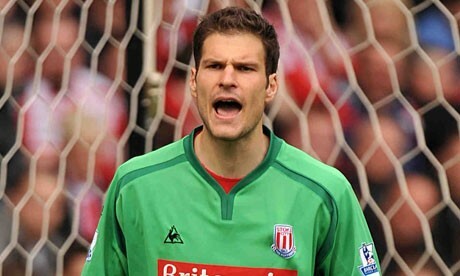 Begovic has become an important player for Stoke, and demands the complete respect of his back four. He is an excellent shot-stopper and has improved his authority of his penalty box from crosses over the last six months, and is certainly good enough to play for one of England’s best teams. A fee of around £15 million would be needed for Mark Hughes’ men to let Begovic leave, but it could be money well spent for Arsenal to end their goalkeeping concerns. We’ve got Viviano and Macey, the talented young keeper we just bought!